Today we're going to spotlight the often ignored game Wolfchild by Core Design, Ltd. It's definitely... average. That doesn't mean it's bad, though! Let's take a look at it! Screenshot of Wolfchild stage 1. Wolfchild is not a game I owned as a kid. In fact, it isn't even a game that anyone I knew owned. I didn't read reviews for it in magazines, nor did I pay any attention to ads for it. My only experience with Wolfchild as a kid was renting it from a grocery store near my grandparents' house. Back then, I would spend the weekend with my grandparents and my grandma would let me rent a game or two on Saturday. In the beginning I would rent the games I knew were good, but eventually I started branching out and trying new titles. Wolfchild was one of those games. I was never able to get very far into the game because it's fairly difficult, but not impossibly hard. I hadn't actually seen the ending to it until I began grabbing images for this feature! The farthest I had ever made it into the game previously was probably stage three before getting slaughtered by the insect enemies. Wolfchild is a side-scrolling platformer developed by Core Design, Ltd. and published by Virgin Interactive in 1993. You play as Saul Morrow, son of scientist Kal Morrow who has created an invention that allows one to transform into a werewolf. Exciting stuff! There are five levels of play in Wolfchild, starting on an airship and ending up in a secret base owned by the terrorist group Chimera. When your life bar is full, Saul transforms into a wolf and gains the ability to throw energy projectiles at his enemies. Losing too much life will revert Saul back to his significantly weaker human form. The controls are fairly good, but when you're down to just Saul punching his enemies you might be in trouble. I believe the problem is that he punches too fast and is then left open for attack, plus you have to get right up on your enemies since your attack range is so short. Being in wolf form eliminates this problem, however. "Fang-tastic!" I see what they did there! There doesn't seem to be a lot of consistency in locations between the levels. Where you start and where you end up are seemingly quite unrelated. Or are they? The first stage is on an airship populated by Chimera agents. After defeating the boss, the platform beneath you crumbles and you fall into the second stage. 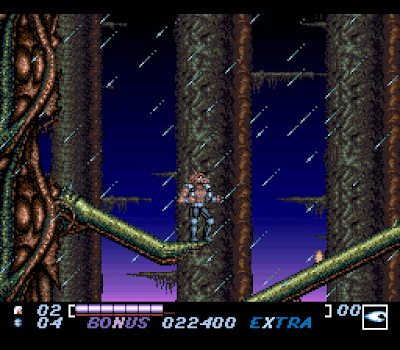 The second stage takes place in a rainy jungle. 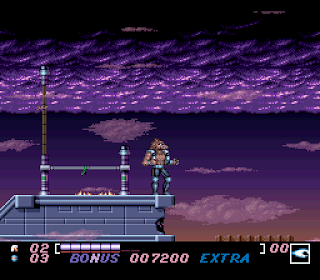 Well, it's rainy in the SNES version. 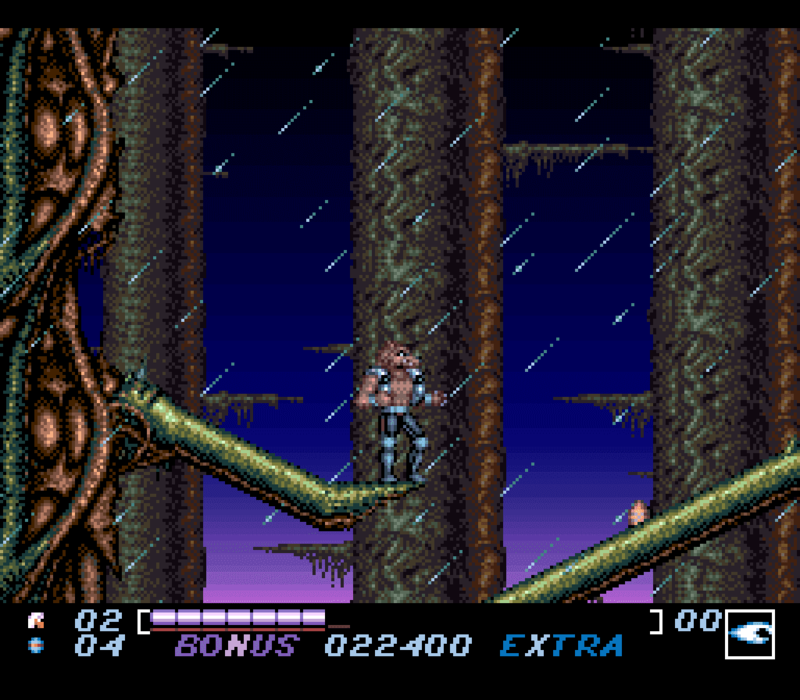 The Genesis and Sega CD versions do not feature the rain. Many plant-like enemies are found in this stage, so watch your step! The third stage is in a temple. 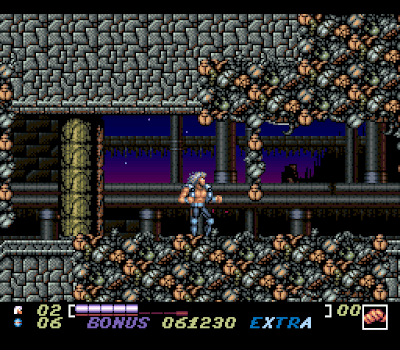 You encounter a lot of insect enemies in this stage. The fourth stage is the Chimera base. It's a confusing and dangerous labyrinthine area. The fifth and final stage is the inner core. If Wolfchild has anything going for it, it's the soundtrack. The soundtrack is phenomenal no matter which system you play it on. I'm partial to the SNES soundtrack, but the Genesis and Sega CD soundtracks should not be missed. The Sega CD version of Wolfchild has all the tracks on the disc, so you can listen to them that way. Some of the music there is incredible! One of my favorite tracks is the tune that plays between the levels. 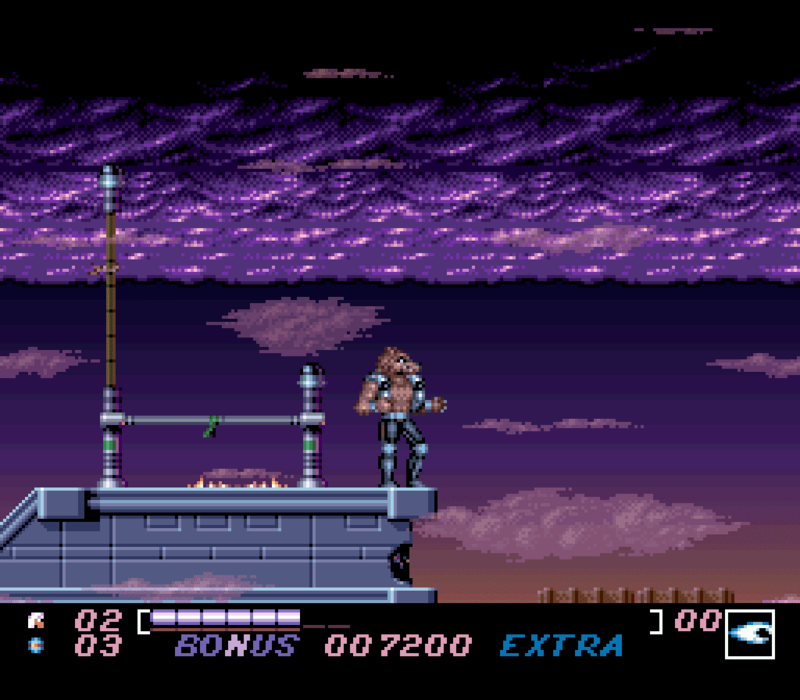 On every version that track is very forgettable, but on the Sega CD version it's an amazing piece. 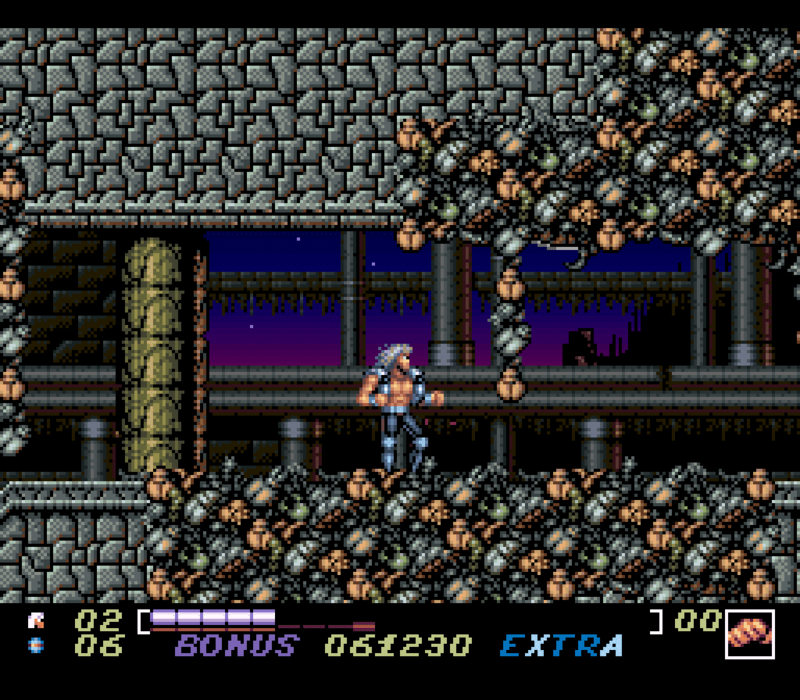 Wolfchild appeared on several systems other than the SNES including the Genesis and Sega CD. It was also released for a handful of other systems in Europe. 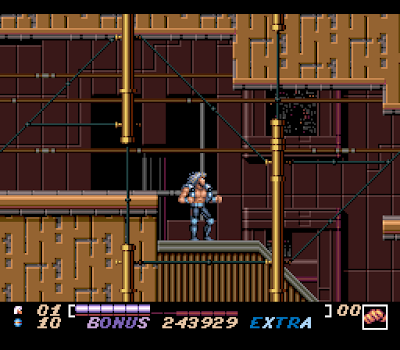 I find the Genesis/Sega CD version to be harder than the SNES one. 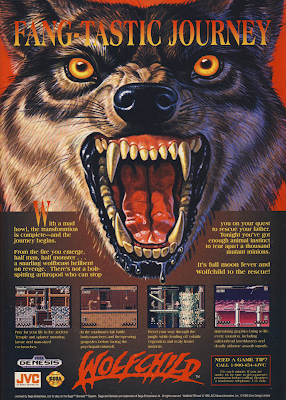 Sega Genesis version of Wolfchild. 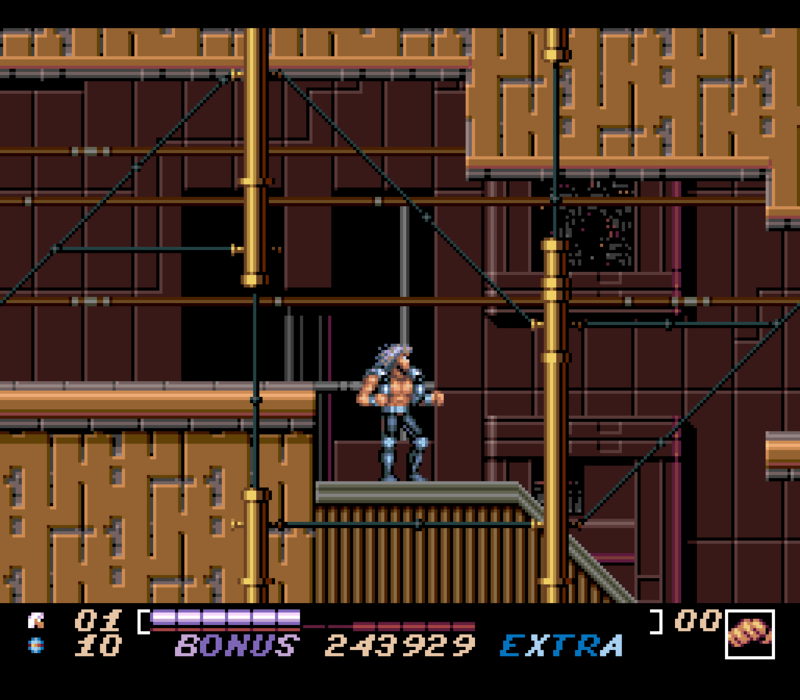 The Sega CD version is very similar to the Genesis version. Noteworthy changes between them are that it includes an enhanced soundtrack and an animated introduction depicting how Saul becomes the Wolfchild. Additionally, the CD soundtrack sounds more like an enhanced version of the SNES tunes rather than the Genesis ones. I believe the Genesis soundtrack is completely different from the others. If the original compositions are there they're buried so deep that I don't recognize them. 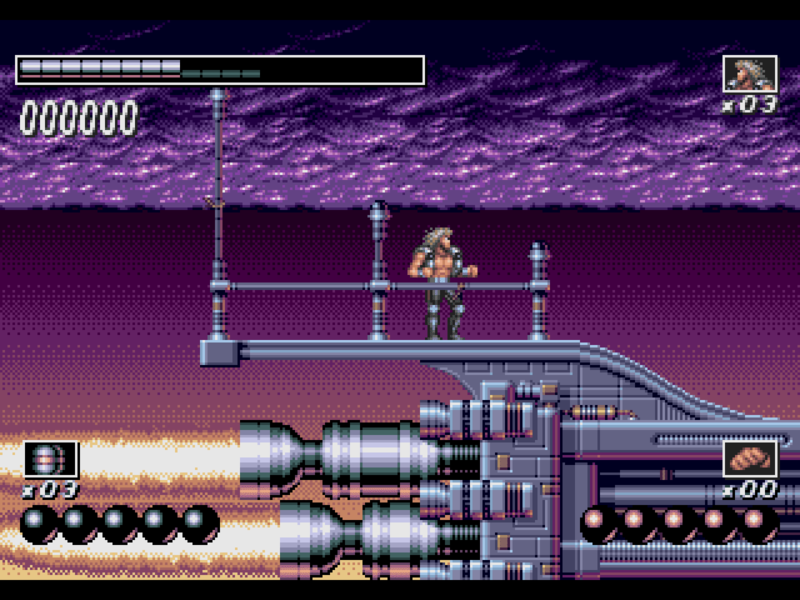 The SNES version is definitely the prettiest of the three, which might sounds like a no-brainer. It's a lot more colorful. 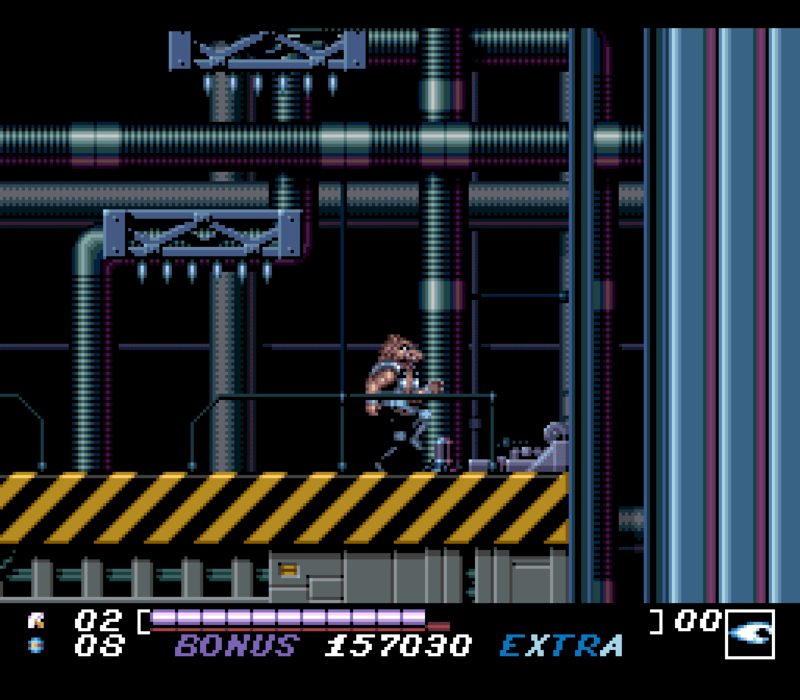 Also, I feel like the characters are a lot smaller in the Genesis version. 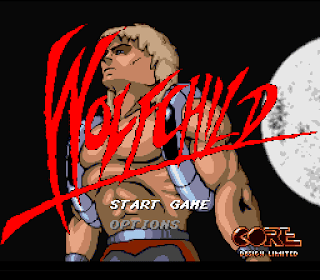 Wolfchild never appears on lists of the best games of the 16-bit era, nor is it typically found on lists of underrated games. It definitely has problems, but it's a pretty decent game overall. Maybe the problem with it is that it's just so forgettable. It's odd that this game appeared on so many different systems, yet it seldom gets mentioned by anyone. I experienced the game originally back when it was released, so that might have some influence on my opinion of it. It's for certain a very generic 16-bit platformer, so I can completely understand why it would go largely ignored. I think if more people tried it out and actually saw the game through that they would find it's actually an enjoyable journey. This is definitely a game I think people should check out. It's not a platforming masterpiece, but it's competent enough to hold your attention. The wolf mechanic is pretty neat, but I kind of wish the wolf stuck around more. Since you eventually lose the wolf form the more damage you take, you might not play in the wolf form as much as you would like. It does make you more excited to turn into it, though. Maybe that was by design.